STEM – not just for the boys! By Devasena Inupakutika, Software Consultant. How do we get more girls involved in science at school, and keep them interested when they go to university? One answer is the STEM Careers Event, which took place at Barton Peveril Sixth Form College last month of this year. Here, students were given a chance to try out a wide range of engaging tasks and find out why and how careers in science and engineering can be exciting and fulfilling for girls too. Guiding them along were mentors from across the disciplines - including me. I was there with the rest of the Robogals Southampton chapter, and helped teach programming along with Amy Tong from the University of Southampton’s School of Electronics and Computer Science (ECS). 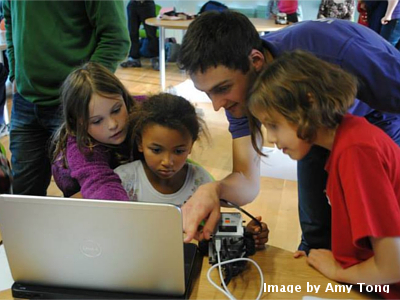 Robogals, a worldwide and student-run organisation, encourages girls to consider a future STEM career through talks and workshops, and shows them the big difference they can make as engineers and researchers. The good news on the day was that of the 80 young people who turned up, around 55 were girls. Working with groups of 20 at a time, we were able to show them how to understand the basics of infrared, ultrasonic, light and sound sensors and how to program robots using LEGO EV3 MINDSTORM. We then set them a challenge where they were to investigate how a team of robots could best go about clearing oil off the roads of Southampton and Eastleigh after a major spill. Encouragingly, many of the young people immediately thought of strategies to go about the task and a few even came up with new ways to clear up an even bigger number of oil spills. As it happened, many had already learned about this at school, which was a good sign, not least because one of our aims was to help students best apply what they are taught to real life situations. In conclusion, the day was a great success and showed how events like this can engage with and inspire the next generation of STEM students. Best of all, it once again shows that girls really are interested in science and engineering, and that all they need is a little encouragement!